The following are court results for the Observer area from Hastings Magistrates’ Court from May 17 - May 25. Kevin Cox (aged 26), of De Cham Road, St Leonards, pleaded guilty to stealing a handbag and its contents. The offence took place at Bexhill on December 30 last year. He also pleaded guilty to dishonestly making false representation to make a credit account and obtain goods. He was sentenced to 16 weeks in prison, suspended for 18 months. Magistrates said the reason for the sentence was that the offences involved vulnerable victims and were aggravated by previous convictions for similar offences that were drug related. The court also made a community order. Tracy Dolby (aged 48), of St Leonards Road, Bexhill, pleaded guilty to driving a Ford Focus on Combe Valley Way, Hastings, on May 3 while more than three times over the drink drive limit. She gave a breath alcohol reading of 111 microgrammes. The legal limit is 35 microgrammes. Sentencing was adjourned to allow for pre-sentence reports and magistrates imposed an intermediate driving ban. Carl Long (aged 25), of Stockleigh Road, St Leonards, pleaded guilty to driving a Vauxhall vehicle on Ellenslea Road, St Leonards, on January 23, with cannabis in his bloodstream. He was fined £250 and banned from driving for a year. Kitana Mia (aged 20), of Amherst Road, Bexhill, was found guilty of causing £475 damage to a Volvo car. The offence took place at Station Road, Bexhill, on December 13 last year. She was also found guilty of causing £200 damage to a Renault Scenic at Station Road, on the same date. She was found guilty of failing to surrender to custody at Hastings Magistrates’ Court on March 22. She was fined £250 and ordered to pay £675 compensation. She was also ordered to pay £660 in prosecution costs. Edward Atkinson (aged 69), of Vale Road, St Leonards, pleaded guilty to driving a Toyota Hilux on Sedlescombe Road North, St Leonards, on April 1 while over the drink drive limit. He gave a blood alcohol reading of 153 milligrammes. The legal limit is 80 milligrammes. He was fined £253 and banned from driving for 18 months. Christopher Bristow (aged 26), of Magdelen Road, St Leonards, pleaded guilty to assault by beating and to using threatening behaviour. The offences took place at Robertson Street, Hastings, on March 28. He also pleaded guilty to causing £250 damage to a door at Tin Tins, Robertson Street, on the same date and to three charges of assaulting a police officer and a charge of resisting a police officer. He was given a two year conditional discharge and ordered to pay a total of £350 in compensation. Tyler Brown(aged 23), of Bishops Stortford, Hertfordshire, pleaded guilty to driving a Fiat car on West Hill Road, St Leonards, on May 7, while nearly three times over the drink drive limit. He gave a breath alcohol reading of 100 microgrammes. The legal limit is 35 microgrammes. The court made a community order with a requirement of 100 hours of unpaid work and banned him from driving for two years. Mark Macdonald (aged 27), of Glovers Lane, Bexhill, pleaded guilty to driving a Vauxhall vehicle without due care and attention and failing to report an accident where damage was caused to another vehicle. 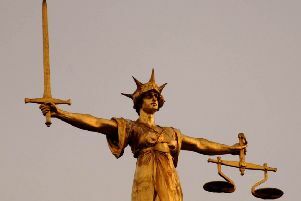 The offences took place at Collington Lane East, Bexhill, on February 20. He was fined £60 for each offence. Leanne McDonnell (aged 25), of London Road, St Leonards, pleaded guilty to stealing fragrance worth £44.98 from T K Maxx, at the Crumbles, Eastbourne, on May 6. She was fined £120. Michael McIntosh (aged 42), of Farley Bank, Hastings, pleaded guilty to being in possession of a quantity of cannabis. The offence took place at Hastings on May 8. He was fined £266. Scott Crittenden (aged 37), of Park Avenue, Bexhill, pleaded guilty to producing 24 cannabis plants at his home on February 24. He was committed to Lewes Crown Court for sentencing. Stephen Jones (aged 22), of Grange Court Drive, Bexhill, pleaded guilty to destroying a clothes airer and a cupboard worth £129.99. The offence took place at Hastings on April 24. He was given a six month conditional discharge and ordered to pay £129.99 compensation. Martin Davey (aged 48), of Harvey Close, St Leonards, pleaded guilty to failing to provide a specimen of breath for analysis when required to do so by police under the Road Traffic Act 1988. The offence took place at Hastings on April 17. He also pleaded guilty to driving with no insurance or licence. He was sentenced to 12 weeks in prison, suspended for 18 months. The court also made a community order with an alcohol treatment requirement and banned him from driving for three years. Magistrates said the reason for the sentence was because of previous convictions and failing to respond to previous sentences. Dominic Harwood (aged 18), of Bluebell Lane, St Leonards, pleaded guilty to two charges of being in possession of a quantity of cannabis. The offences took place at Hastings on April 24 and July 30 last year. He was fined £233.